Real wood furniture looks great in any room of your home. Providing an authentic and solid finish, real wood furniture can typically cost more than its veneer counterpart, which is why it makes sense to look after it. A & J Painters and Decorators discuss the benefits of varnishing real wood. Varnish does not necessarily “cover” the wood or change its colour – depending on the option you choose – it is there to create a waterproof barrier that enhances the natural beauty of the wood. What Are The Benefits of Varnish? There’s no doubt about it – spills and knocks are inevitable in a busy family home. Unfortunately, these typical occurrences can cause scratches and damage to real wood. 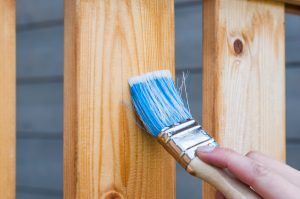 With a barrier created between the wood and other elements such as grease, dust, dirt and liquids, varnishing wood helps to protect it and prevent staining. Furthermore, applying varnish to a wooden surface can make it much easier to clean. Wood contains multiple tiny “pores” that can attract dirt and become the perfect breeding ground for bacteria. Varnish will act as a seal over the wood, keeping it looking great for years to come. Something you may be surprised to find out is that real wood can absorb moisture from the air, which can cause it to expand. Once dried out, the wood may then shrink back to its original state and this process can result in the wood warping or splitting over time. By coating the wood in varnish, moisture cannot be readily absorbed. So there you have it, it makes sense to look after your solid wood furniture by applying a coat or two of varnish. Our experienced team can carry out jobs large and small. So if you require varnishing for your floor, furniture or window frames, we welcome you to contact us. Please call our dedicated team today on 01234 857057 or fill out our online enquiry form and we’ll be in contact shortly.